Where do you feel a soft heart, calm mind, or abundance? My answer is always the beach. Here's a photo I took at Pass-A-Grille Beach near St. Peteresburg, FL. 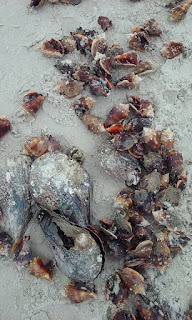 I was greeted yesterday on my walk by the gulf with THOUSANDS of these shells! Sadly, half were dead stranded from the gulf...some were borderline so I tossed several back in until I tired. "Did it matter?" you might ask. YES! to those shells now hopefully alive. Reminds me of the classic “Starfish” story used by many a motivational speaker--even me once upon a time. Now I am blessed with the real deal experience. At the same time I am puzzled, even troubled, by such waste of these beautiful mollusks. So I will fearlessly ask Mother Nature "Why?" Perhaps her answer will help me spin my gold to see something I'm not yet understanding.